The exhibition explores the nature of ‘conquests’ in the Andes – looking at periods of dynamic cultural convergence before, during, and after the Inca Empire (1400–1532). We focus particularly on the blending of styles and forms in the visual arts and material culture. The objects created during these periods reflect the blurry boundaries and plural identities that the term ‘conquest’ often belies. The DMA show covers 1000 years of Andean cultural history and culture change. In other words, we approach each stunning artwork individually as an important marker of regional interaction, exchange, and appropriation. They allow us to imagine individuals in a population, where archaeologists may have yet to determine the exact nature of interaction between cultural groups – be it political control, economic exchange or social interaction. The art of the Andes prior to the Spanish conquest has been the focus of my research for many years. Since joining the museum in September 2013, I have delved into the collection, in particular the substantial holdings of Andean art. While many of these impressive objects have been on display in the permanent galleries, the museum has not presented an exhibition dedicated exclusively to Andean art in over 30 years. So I felt it was an ideal time to design an exhibition that showcases the most stunning pieces in context with other remarkable items in the collection, some of which have never before been exhibited and which received renewed study and conservation treatment for their display. Generous loans from local and regional institutions, as well as private collections, serve to enrich the exhibition context and themes. As the curator, I have deep appreciation for so many of the artworks on exhibit. My sincere hope is that every person who visits the exhibition discovers a favourite item, or two, or three. 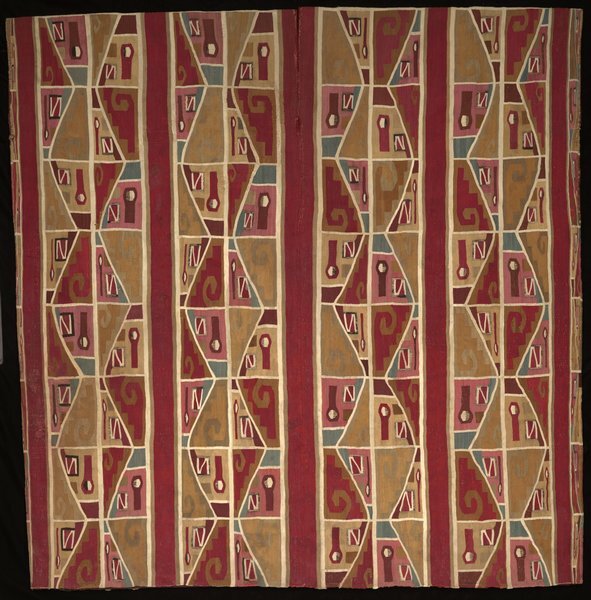 The greatest pleasure for me in designing this exhibition was exploring the diversity, dynamism, and technical mastery of textile arts of the Andes. Through handling objects and discussions with specialists in the field, I was able to delve deeper than ever before into the manufacture, production and significance of personal adornment. There are some extremely fine textiles on show, remarkably preserved and with strikingly vibrant colours. The exhibited objects range considerably in size, condition, and design. We needed numerous different mounts, lifts, strainers, and frames to show the artworks properly and maintain a pleasing visual balance within the gallery spaces, while also progressing the exhibition narrative. As any visitor will appreciate, the Andean artworks are exceptionally enhanced by the stunning design, craftsmanship and attention to detail of the DMA staff behind the installation. The greatest challenge then, also afforded me the delightful opportunity to work closely with an amazing team. The galleries feature various different case types, from built-in wall cases, to wall mounts and free-standing pedestal cases. In some rooms, the cases fill every sight line while other galleries focus attention on singular items or clusters of objects. But thanks to the professional experience of the DMA staff, we have run into few challenges, and excitement has been building as the galleries come closer to completion. There are many fine objects within the holdings that didn’t make it into this exhibition. I look forward to being able to rotate some of these objects into the permanent Arts of the Americas installations on the museum’s fourth floor – hopefully with a newfound public interest. ‘Inca: Conquests of the Andes’ is at the Dallas Museum of Art from 15 May–15 November. Are the two statuettes in the picture posted with this article dogs? How big are the statuettes?